Monday – 3/19 – Cheeseburgers – After all the cooking and food prep yesterday (Lobster Lasagna) we decided to take it easy and make something simple for dinner. This turned out to be Cheeseburgers which really need no elaboration, except that I used the leftover Shrimp Dipping Sauce from yesterday mixed with some Thousand Island that I had. The funny part is that Ev refused to try the Shrimp Dipping Sauce (which he thought he wouldn’t like). He didn’t know that I used that for the Dressing for the Burgers and he really liked it. So much, for pre-judging something before you try it. The Shrimp Dipping Sauce from Sunday was Mayo, Dijon Mustard, Horseradish and a dash of Green Tabasco. It was really pretty good! Tuesday – 3/20 – French Onion Soup & BAT’s – since it was pretty cool out and I had lots of Onions (I buy the Sweet Onions by the 10lb bag) I decided to make French Onion Soup. Ev wanted BLT’s and I thought that would be a pretty good combination. Instead of BLT’s I made what I call BAT’s. Bacon, Avocado and Tomato Sandwiches which we made on Hamburger Buns. Wednedsy – 3/21 – Enchilada Casserole + Guacamole and Green Salad – today was my MahJong Afternoon and I wanted to make something simple for dinner. I made Enchiladas a few weeks ago and I can never make a small amount, so after I made what we would need for dinner and maybe a leftover lunch, I used the remaining ingredients to make an Enchilada Casserole. For this I used a 10” Pyrex® baking dish. I placed a small amount of the Enchilada Sauce (homemade) on the bottom and then a layer of Tortillas. Next went some Cheddar/Jack Cheese, sliced Green Onions and Olives and some more Sauce. 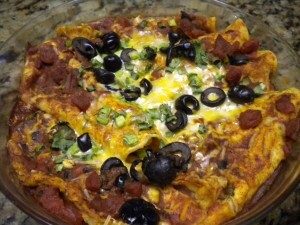 I layered the Casserole like this and on the top went more Sauce, Cheese, Green Onions and Olives. Then I wrapped it well and froze it. All I had to do for Dinner tonight was to thaw it out along with the remaining Enchilada Sauce which was added to the Casserole before baking. 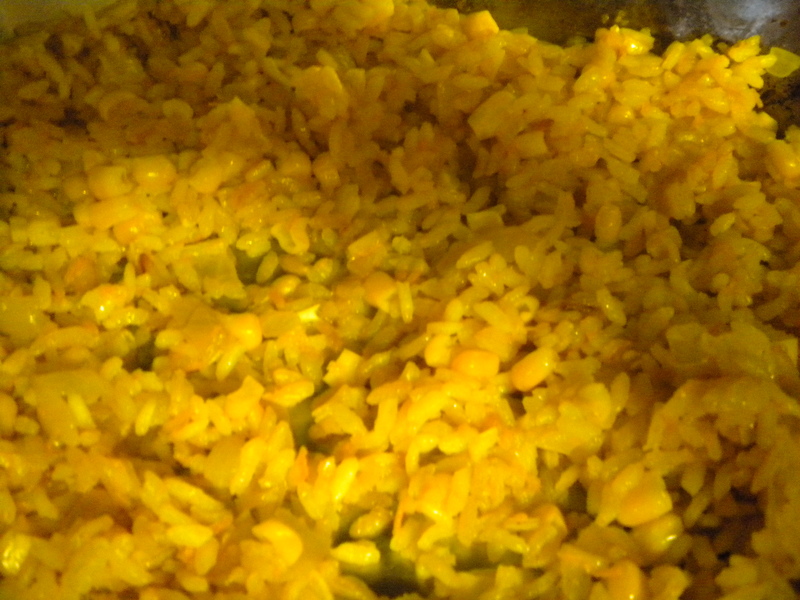 When I came home all I had to do was make some Mexican Rice (takes about 20 minutes), mexican-rice/bake the Casserole and make a Salad and the fresh Guacamole which is really simple to do, if you use your Food Processor. I like the Guacamole chunky so that you can actually taste the Avocado. Dessert was the Chocolate Chip Cookies that I had made that morning. Ev always needs his chocolate so I usually make something that is Chocolate at least once a week. Thursday – 3/22 – Baby Backs, Baked Beans & Cole Slaw – felt like something meaty tonight so made oven Barbecued Baby Backs, Baked Beans and homemade Cole Slaw. The Baby Backs were dry-rubbed with my special Pork Dry Rub and allowed to marinate in the refrigerator all day. An hour before dinner time, I placed them in a baking dish (bone side down) with about half an inch of water on the bottom and covered them with foil. Placed in 350 degree oven for 45 minutes. After 45 minutes, removed the cover and slathered with BBQ Sauce. While the Ribs were Baking, I made the Coleslaw, something which is simple to do if you use your Food Processor and the 2mm slicing blade for the cabbage. My coleslaw is much tastier and fresher tasting than any you can buy, even in a delicatessen. I cheated with the beans and used the canned variety. Usually I add some sautéed Onions to them and a little Brown Sugar or Molasses and Lemon Zest, but this time I really did not need to do anything. Friday – 3/23 – Asian Stir Fry Vegetables with Tofu – after the dinner of ribs last night, I felt like we needed something healthy and fresh tasting, so I decided to make an Asian Stir Fry. For this I used one/half of a Globe Eggplant (I peeled, sliced and salted the whole Eggplant and will use the other half for another dish, probably an Eggplant Dip that we all like), one half pound of brown mushrooms (which I purchased today at the California Mushroom Farm in Ventura – they are open to the public & have really good prices and of course, freshly harvested Mushrooms). In addition I used Sweet Onions, Garlic, Tofu and minced Red Bell Peppers. After the Eggplant had given up some of its liquid (salting globe Eggplant also helps to reduce the bitter taste that the sometimes have), I rinsed it and patted it dry with paper towels. I then cut the slices into cubes. I sautéed the Garlic and sliced Onion and then added the Eggplant. The Tofu was rinsed, dried and cut into cubes also and then added to the Stir Fry. I also added Asparagus tips that had been left over from a previous meal. Before making dinner, I also made some Triple Lemon Cookies. 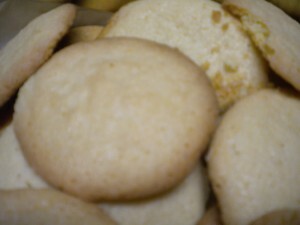 This cookies is a nice crisp cookie with lots of lemon flavor. Just the right thing when you want something crisp and flavorful, but not too sweet and gooey. The Cookies were our dessert. Saturday – 3/24 – Today, I decided to retry the Crab Creole recipe which I am going to do for my PreTeen/Teen Class at Let’s Get Cookin’ in April. I created a variation on the recipe and decided to make it Crab Nachos as I had Tortilla Chips that were begging to be used. 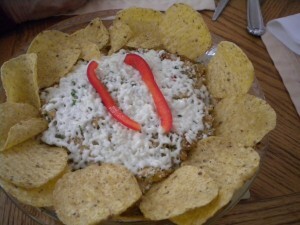 Just before taking the Crab Creole out of the oven I sprinkled on some Queso Fresca (Fresh Mexican Cheese). After taking the Crab Creole out of the oven, I surrounded it with the Tortilla Chips. The Nachos were served with the leftover Cole Slaw from Thursday night along with Fresh Strawberries that I purchased at the Farmer’s Market today. Dessert were the Chocolate Chip and Triple Lemon Cookies. After dinner tonight, I made a Batter for Ebelskivers for Breakfast on Sunday Morning. This recipe was given to me by one of my Danish Exchange Students when i was teaching High School. The recipe was originally from his Grandmother. This recipe is different from most of the ones here in that it uses yeast instead of baking powder and therefore needs time to raise up. Thirty minutes would be sufficient, but I prefer to make the batter the night before. You must always allow extra rooms for the raising of the batter or otherwise it will overflow the bowl and make a mess in the refrigerator.